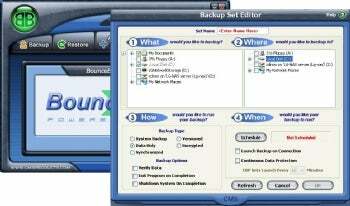 BounceBack UItimate ($69, 30-day free trial) is unique in the backup software world. It's a jack of all trades that syncs, backs up files, does continuous data protection, versions, schedules, supports multiple destinations and will mirror your system drive onto an external drive. And I really mean mirror, as in an exact copy from which you may boot if your main drive fails. Ultimate also has backup sets, scheduling, multiple destinations, and versioning all of which are missing from the significantly cheaper BounceBack Essential. BounceBack Ultimate's may look colorful, but the interface has matured over the years into a model of efficiency--and it packs serious power. Version 9.2 retains what is one of the more, err, I'll just say more colorful-looking interfaces in the industry. Don't let its appearance distract you from the serious power under the hood. I'd try to describe it, but you're far better off taking a gander for yourself. Fortunately, over the years CMS, while leaving the look intact, has gradually trimmed and condensed a rather poor workflow it into a concise, easy-to-use interface with all the options within easy reach. My only gripe about the BounceBack Ultimate is the price. In a world of worthy $50 backup programs--or the $29 BounceBack Essential--$69 seems a tad pricey. Still, BounceBack Ultimate is unique, has worked great for me, and is simple enough to use that most users can figure it out in short order. Think of it as an easy way to add RAID 1 redundancy to your system without the hassle of digging around your PC's innards. If you need the extras mentioned up front, then BounceBack Ultimate is worth the premium. However, I'm thinking the majority of users will be fine with Essentials. Tip: BounceBack's mirroring function requires an entire drive, so don't back up a 160GB drive to a 1TB external drive or you'll be wasting a lot of space.